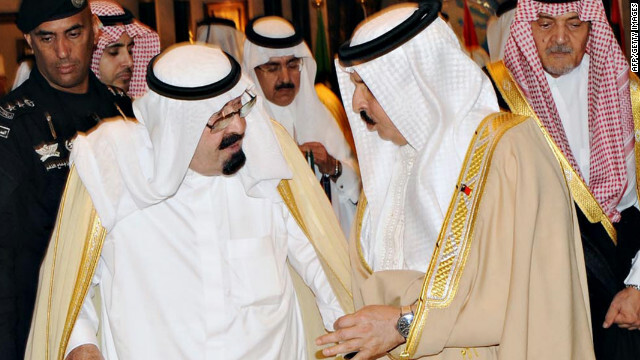 King Abdullah of Saudi Arabia, left, talks to King Hamad of Bahrain last month. Will the two countries form a partnership? Editor’s note: Geneive Abdo is director of the Iran program at the Middle East Institute in Washington. The views in this article are solely those of Geneive Abdo. Ever since Saudi Arabia’s King Abdullah proposed forming a political federation among the six members of the Gulf Cooperation Council, the pros and cons have been fiercely debated across the Middle East. For many Arabs in the region, particularly Shia communities in Lebanon, Kuwait, Saudi Arabia and particularly Bahrain, such a proposal suggests an attempt to form a dominant Sunni bloc that would tip the balance of power at a time when tensions are escalating between Shia and Sunni Muslims in the wake of the Arab uprisings. Five countries in the GCC — Kuwait, Oman, Qatar, Saudi Arabia and the United Arab Emirates — are Sunni-dominated societies. Only Bahrain, the sixth GCC country, has a Shia majority. With the sectarian conflict in Syria escalating and spilling over into Lebanon, the violent clashes between the two sects in Iraq, and the uprising in Bahrain by a predominantly Shia opposition, the proposed political federation is likely to enflame the regional conflict. “Shias in Lebanon have expressed reservations about (a union). … Shias in Iraq are disturbed by the idea as well,” says Jasim Husain Ali, a prominent leader in Al Wefaq, Bahrain’s main Shiite opposition party. Some GCC leaders, however, argue that a union is needed first and foremost to develop security cooperation amid the instability now sweeping the Arab world. Also Iran, the nemesis of Saudi Arabia and Bahrain, is perceived to be seizing upon opportunities in Iraq and Afghanistan; Iran played a significant role in Nuri al-Maliki becoming prime minister of Iraq more than a year ago, and in recent weeks the regime has worked hard to keep him in power amid demands for his ouster. But forming a union to marginalize Iran could produce the opposite outcome. Iranian officials have been outraged ever since the union was publicly debated in mid-May at a GCC advisory summit in Riyadh. Iranian Parliament Speaker Ali Larijani, in particular, sent a powerful warning to the GCC: “If Bahrain is supposed to be integrated into another country, it must be Iran not Saudi Arabia,” he was quoted as saying in the state-run media. Larijani was not only lending support to Shias in Bahrain, but he was also referring to Iran’s claims on Bahrain based upon the island’s history of being part of the Persian empire. More from GPS: What were the Saudis thinking? Any union, whether it is just between Bahrain and Saudi Arabia or a full economic and political integration of GCC member states, would most likely spark a response from Iran. Military action is highly unlikely, but Iran would be compelled to meddle, particularly in countries where there is a sizeable Shia population. The rhetoric and threats from Iran would surely grow harsher, and Iran might even lend support directly or indirectly to Shia populations in GCC countries that oppose the state. This is exactly what the Saudi and Bahraini governments wish to avoid. Since last year, Bahrain has accused Iran of encouraging the Shia-dominated opposition to rise against the government, but Iran has denied involvement. So what is the solution? Some in the Gulf are calling for a public referendums to be held, if not just in Bahrain then in all GCC countries, and this seems like a logical step forward. King Abdullah and King Hamad bin Isa al-Khalifa of Bahrain have both stated their commitment to political liberalization, and this would be significant sign of their willingness to get in step with other Arab countries trying to democratize. If referendums were held, the primary concern among societies is that their countries would lose independence. This is particularly true in the case of Bahrain. As a country that derives national pride from its independence from Great Britain in 1971, Bahrainis fear the country will lose its independence if a union is developed with Saudi Arabia, which last year sent troops across the border into Bahrain to abort an uprising against the government. The troop deployment was widely criticized. Now, many see a proposed union as Saudi sealing control over this small island. But there would be other fears as well. All Bahrainis, whether Sunni or Shia, enjoy far more liberal, cosmopolitan lifestyles than people in most Gulf states. There is overwhelming concern that the Saudis would impose its conservative Wahhabi doctrine on Bahrainis. Bahrainis fear that the proposed union with Saudi Arabia would be an avenue for restricting women’s rights and imposing curbs on social taboos as defined by the Saudi government, such as drinking alcohol. Bahrainis have considered their country an island of enlightenment in a region of social and religious conservatism. The bottom line is that as Shia-Sunni relations deteriorate in Bahrain, Syria, Iraq, and Lebanon, a Sunni-dominated political federation is sure to further deepen feelings among the Arab Shia of being under siege. And this discontent would surely lead to more instability in the Middle East. GCC leaders should keep this in mind when the political federation is debated again in December. The views in this article are solely those of Geneive Abdo. Next entry »Is Obama leak 'scandal' overblown? These Penguins are like a sleeping Giants. They don't work and they can't create anything. They are just ballooned by Oil Money. What else the desert Men are discussed? It's just, who will fill their Bank accounts. How about if there weren't Oil in Arab Countries? Where will they be? That's all we need, another block of nations controled by the West and subservient to it! This is getting ominous! If I was a good muslim like you, I would be scared s h i e t l e s s.
Towel Heads is what Towel Heads do. A possible Bahrain-Saudi Arabia union would only benefit the U.S. which has its Fifth Fleet there. Iran sees it as a threat it would be engulfed in a hostile neighbourhood. please read: Iran sees it as a threat. It fears to be engulfed in a hostile neighbourhood. In the past Sunni–Shia relations had been marked by both cooperation and conflict. Tensions between the two communities intensified when infightings break out in Iraq, Bahrain and Syria. What's wrong with the United States of Arabia? That catchy phrase "united states" has been gaining traction and adherents lately in Europe. The Middle East has historically been averse to democratic movements. Under these Salafist governments all undesirables will be beheaded. Thank you, toto. How true that rings! These Salafists or better said Islam Aristocrats, have very little respect for human life and well being. Time has come for Pakistan to take the leadership role regionally as well as in the muslim world/middle east. the Zionist of America wont like to see any countries to unite. Divide and occupy,is the only way to keep the Zionists in US and Israel safe. Once the dogs of Suadi Arabia are gone the moslim world shall unite and rule world once again. Only an islamic pig can go from one statement to the next.